Welcome to our group's campaign log for The Devil's Spine, a mega-adventure by +Monte Cook for the Numenera campaign setting. This is my second crack at this terrific module, my first taking place over two years ago, back when I first started GM'ing Numenera. I've learned quite a bit since then, and have thoroughly enjoyed so many of the enigmatic and peculiar aspects that can only be found in the Ninth World. But something about this adventure continued to call to me. I really wanted to circle back and give it another go! I'll be perfectly up front with you all: this is going to just be a simple campaign log. Don't expect too much commentary at the beginning of each session report. Initially I was just going to do one, massive log that I updated week after week, but I got a little nervous of deleting the entire thing by accident with continued editing of the same post. I also don't want you to expect any high-quality writing here... this is pretty much just going to be an information dump session after session. If you have any questions or remarks about The Devil's Spine adventure, our campaign, or anything else Numenera related, please feel free to leave a comment below! Okay, I said no commentary, but I need to add a little commentary when it comes to my players and the characters they created. I absolutely adore each of these imaginative designs. During last night's session we spent the first hour ironing out descriptions and backgrounds, and creating connections between each of the characters. That way, when we started the actual adventure, there actually appeared to be real relationships between the five Numenera hunters. Description: Short. Wears an anachronistic hat and leather jacket. Carries an energy whip. Background: Discovered a synth time capsule, found a strange exotic laser disk of an explorer being chased by a gigantic boulder. Decided to pattern his own appearance after this person. Now he travels the land with his energy whip and the laser disk, in search of adventure. Connection: Keane always seems to be getting in Belmodan's way, and is frequently struck by the Seeker's energy whip in combat. Description: A big, strong, well armored anarchist, who doesn't like the government. Background: Keane is a biomechanically modified warrior, created by the nobility of the Pytharon Empire for reasons unknown. Connection: Keane promised PL4T0 to break the first thing that he is commanded to. This opportunity hasn't quite presented itself yet. Description: A crazy, muttering man dressed in eclectic assorted fashion styles. Many of his garments seem to be from impossible time periods. Constantly plagued by deja vu. Background: A bearer of forbidden knowledge who does not remember his past per se. Nero has multiple memories of his past, but with chunks of missing time. Occasionally he blacks out only to not remember who he is. Nero is convinced that time itself has rewritten him. Connection: Nero is a distant ancestor of Ruun. Ruun anchors Nero to the present. Description: A tiny, floating 5" dodecahedron wearing an aviator cap. Background: A helper-bot-droid-thing created by a prior world's civilization. One part extra hands, one part knowledge database. PL4T0 has a multitude of skills programmed into its memory bank, but many are not accessible because it's been in a low power state for quite some time. Connection: PL4T0 picked up and activated by Nero after a long dormancy. Nero did not realize that PL4T0 was a self aware entity at first, but is learning this over time. Description: A 7' tall, lanky, late teen. Very greasy and dirty, with a feral appearance. Covered in deformities. Background: Ruun was a normal kid until around ten years old when he was abducted from his village. Ruun does not know who or what abducted him, but occasionally has flashbacks to bright lights and experimentation. Six weeks later he returned, but started to change physically. Ruun grew abnormally fast, freaking out the rest of his village. Eventually he was driven out of the village, and learned his fighting abilities on his own. Connection: Keane and Belmodan know that it's beneficial for Ruun to occasionally eat a creature every few days. A reckless band of numenera hunters recently came to the city of Uxphon, just north of the Steadfast. Two of the wanderers, Keane and Belmodan, had been friends and companions for the last five years, exploring all along the edge of the Steadfast and the Beyond. Three months ago, during a jaunt into the Beyond, the two compatriots met Ruun, a young barbarian with a wild temper and feral appetite. Not long after, a bizarre man named Nero approached the party, with a strange interest in Ruun. The last member of the crew, PL4T0, was actually discovered by Nero during a numenera hunting excursion, with the nano believing the small hovering bot to be an artifact from the prior world. After a month of learning the in's and out's of Uxphon, Keane offered his team up to the local rebellion efforts. Keane's contact with the rebellion was a man named Doomi Laast. The rebels sought to overthrow the local oligarchy, and free the people of the Uxphon. For their first mission, Keane's team was to ransack the home of Baron Tichronus, and keep any interesting pieces of numenera or information that could be useful to the rebellion. The team broke into the home and started their search. One of PL4T0's cyphers showed four occupants: one on the main floor, and three in an area below the estate. Upon entering the home, Nero popped a reflex-improving cypher. The chemical inadvertently gave Nero a vision of being in this place before, but in a prior world when it the Earth was part of the Grand Galactic Empire of [an unpronounceable guttural noise]. Nero made several loud comments, drawing the attention of Dorial, the house's butler. Dorial wasn't ready for visitors, but before he could call the guard, the butler was cornered, threatened, and told to stay quiet and out of the way. The party then started searching the house. Along the western side of the estate was a great, circular, two story library. PL4T0's cypher showed that there were three human sized creatures below the library, so Belmodan and Nero began going through the books. Eventually they found a set of buttons with weird symbols. Collectively using their skills, abilities, and pieces numenera, the trio uncovered a secret chamber below their feet. But when they triggered the right combination of buttons, the floor disappeared, and everyone tumbled down thirty feet. Everyone but Ruun, who was busy in the kitchen eating pickles. The secret chamber was full of purple eggs, with weird slithering creatures moving around the fallen adventurers' feet. At the edge of the chamber, three naked humans with black spines huddled together. PL4T0 went to investigate the humans, but the rest of his human companions soon learned that the weird slithering creatures were not so mundane. The creatures crawled up their legs and took root in the numenera hunters' backs. Belmodan and Keane removed their garments, revealing that they now had black spines of their own! The PL4T0 tried helping its companions remove the parasites, but when the bot attacked them, the naked humans rushed into combat. A brutal combat ensued, with Belmodan ripping off several of the naked humans' legs with his energy whip. Ruun eventually came to investigate what was going on, but was pushed into the hole by Dorial. Ruun caught the ledge, lifted himself up, and then pushed Dorial down. Then Ruun jumped down thirty feet onto Dorial's head, killing the butler. When the naked humans were killed, the party heard two things. The first was a woman's voice above, in the estate foyer, calling for the Baron. The second was the scratching of a stone woman's form, sliding out from a fleshy passage in the southern wall of the pit. "I call reverse dibs." - Marc on getting murdered. "I was here before the hills were made!" - Nero started stating loudly upon entering the Tichronus Estate. "I'm going to cup him in the face and say 'I'm going to kill you in a moment.'" - David (playing Nero) to Dorial. "I'm just thinking Indiana Jones and the Raiders of the Lost Ark would've ended really early if there had been a laser whip." - Marc commenting on Andy's character Belmodan, and all of the leg-ripping-off action going on. Thanksgaming is becoming a Walls family tradition in our house. This tradition started two years ago, when I ran a turkey-themed game of The Strange for my family in Delaware. The experience went so well that we went for repeat last year but with just the wife and kids. Well now it's just expected that I am going to do a Thanksgiving themed game every year! This year, however, we're changing things up a bit. First, I decided to change out The Strange for +Bruce R Cordell's dark fantasy Cypher System setting: Gods of the Fall. Second, instead of giving you a big adventure recap, showcasing how much fun we had playing, I thought I'd just share the adventure with you, so that you can run it for your own gaming group! We'll be running it for our family tonight, and I may even chat about the results later, but the main focus of this blog post is to give you something to try out. One more thing... the map. 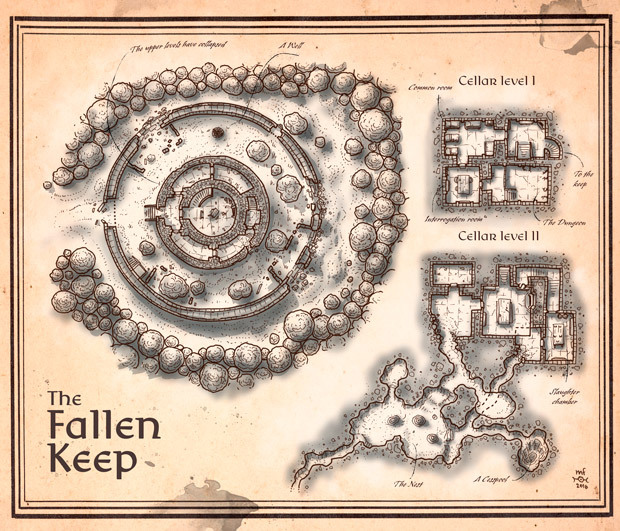 A lot of the inspiration for this map came from The Fallen Keep, a terrific piece by +Miska Fredman. If you'd like a high-res version of this map, with multiple variations, you can download it now over at DrivethruRPG. Alternatively, you can be supercool like me and just become one of Miska's patrons over on his Patreon page. That's how I roll, and I suggest you roll with me! With the quality of an afterlife in question, many in the city of Cryserech cheat death by undergoing a process known as the Necromigration. This process involves the participant paying a healthy sum, getting ritually murdered, and then returning to life as a Reanimated corpse. But what if there was another way to extend one's life? Vincenzo Vincenzi, a native Cryseran, developed an alternative that would allow the participants to continue living in a flesh and blood form, albeit with a few added feathers. A bit of a mad scientist and expert alchemist, Vincenzo had worked on a way to transfer the consciousness of an individual from one body to another. But with a lack of willing human participants, Vincenzo turned to the one creature that he knew he could count on. Trained War Turkeys. While serving in the Cryseran military, Vincenzo trained war turkeys for combat. With their reinforced beaks, and stealthy manner, War Turkeys were silent killers while War Hounds just tended to do a lot of barking. Vincenzo's method was simple. An alchemical formula was mixed and placed in a large jar. The patient looking to transfer their consciousness would have their brain liquified and then poured from the nose into the same jar. The host's brain was then liquified and removed as well. So long as Vincenzo performed the process within a few minutes, all he had to do was pour the patient's brains (mixed with the chemicals) into the host's nostril, and the organ would reform. Although the initial process was just supposed to be tested on turkeys, eventually it could be used from human to human. Perhaps an old human could have their brain poured into the skull of a criminal or slave. The opportunities were endless! But Vincenzo needed a plan, and he had some War Turkeys. So he had his assistant Daphne attempt the process on him, using one of his War Turkeys as the host. But Daphne made a mistake! She didn't fully liquify the brain of the War Turkey. 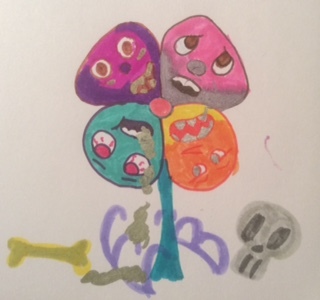 So when Vincenzo's brain porridge was poured into the skull of the host, it fused with some of the remaining Turkey brain bits. Vincenzo retained much of his own consciousness, but also many of the motives of a regular Trained War Turkey - destruction, gobbling, and a "turkey-kind first" attitude. Vincenzo Vincenzi took on the moniker of the Foulest Fowl, and started up the Feathered Salvation, an organization that offered the citizens of Cryserech a true alternative to the Necromigration: the Fowl Soul Transplantation. The player characters (PC's) have been approached by Ishver, the Necromigration Conductor of Cryserech. Ishver has heard that a new and terrible alternative to the Necromigration has been researched by a mad alchemist who calls himself the Foulest Fowl. The wicked scientist, and his Feathered Salvation, is attempting to lure Cryserans to the edge of the Dead Wood where they can attempt a process that will allow them to keep a flesh and blood form, and get a brand new body. The Foulest Fowl even claims that his new process doesn't even require getting staked to a pole and left to die... it's supposed to be a lot less painful actually. When the PC's arrive at the edge of the Dead Wood, it does not take long to come across the Fallen Keep. It is important to keep in mind the scene from the edge the forest. First it's quite dark. This is the Nightlands, so there is no sun within view. This could lead to a really nasty GM Intrusion opportunity, with one of the PC's getting struck by lightning. Level 5 Might Defense roll or be reduced down the damage track one step for 10 minutes. Wait, that's a pretty nasty GM Intrusion isn't it? Tough... this is Thanksgiving... and that's how we roll! If the PC's search (difficulty 5) they will find large turkey tracks in the mud surrounding the broken walls of the keep. Map courtesy of +Miska Fredman! Get yours here. The outer wall of the Fallen Keep is broken in several places but fairly easy to navigate. Entering through the obvious entrance seems to make sense, but there's a gobbling risk. Going through the eastern entrance brings about the wrath of three Trained War Turkeys. Each Trained War Turkey attacks from darkness, attempting to surprise the PC's (level 6 difficulty, given the darkness). If they win, they get to attack first. Climbing the broken walls is easier, with only a difficulty 2 to not trip and fall (3 points of Might damage). The main portion of the keep is rather empty. A single hallway circles the central chamber. Of course, there is danger in this area as well. If the PC's haven't encountered the 3 Trained War Turkeys in the outer area, they attack the PC's from behind when they enter this area. The northernmost chamber of this area is full of dead turkey carcasses. These are the Trained War turkeys who have died in surgery. There are six corpses in all, and if the PC's search them (Level 4 difficulty), they will find signs that some kind of procedure was done to them, as well as the nature. The central chamber leads to the roof of the keep. There, the PC's will find cages full of carrier pigeons, and hundreds of parchment letters reading the following: "Friends of Cryserech, know that there is an alternative to the foul Necromigration. Join the Feathered Salvation, and transfer your soul to a living, breathing creature today!" The eastern chamber has a stairwell that leads down into the Cellar Level 1. The chambers on this level were built by Vincenzo's now dead servants to serve as living quarters for those looking to take on their new form. Now they reek of dead flesh, and are home to the Ghoubblers: the failed experiments of Vincenzo. While his own experiment worked, he is no longer able to do the procedure properly. Ghoulbbler attack! In one of these rooms the party is attacked by a trio of Ghoulbblers. These beasts fight to the death, and make a lot of noise doing so. In the common room, the PC's will find the dead bodies of several older humans. Most have been pecked terribly by Ghoulbblers. All are wearing ceremonial turkey feathered robes. The dungeon in this cellar houses three humans that tried to change their mind. Dilbers, Mack, and Jalla. The three humans are all in their mid to late sixties, and will claim that they feared becoming undead. They also didn't want to become turkeys, and once they discovered the terrible procedure, they revolted. Unfortunately they were all captured and placed in the dungeon. Also in the dungeon is Daphne. Daphne refuses to assist her former teacher Vincenzo in performing any more operations, but the Foulest Fowl cannot kill her, as she is the only person who was able to perform the procedure successfully. Daphne wants her freedom, and claims that Vincenzo was once a good man until his mind got "gobbled." The heart of the operation, here's where Vincenzo is attempting to change the world... one turkey at a time. If the PC's search the cellar chambers without being careful to remain quiet, they should be under constant attack by Ghoubblers. Throw two or three against them every so often. The Nest is home to the remaining Trained War Turkeys. There are five left alive, as well as a nest of smaller eggs. On their home turf the Trained War Turkeys fight much more brutally, causing an additional 2 points of damage with their savage beaks. GM Intrusion idea! While fighting the Trained War Turkeys, the PC's fail to notice several chicks stalking them on the ceiling. Several of the chicks descend on a PC and peck at their eyes. They are blinded for the next round, and must make a Speed test (level 3) to pry them off after. The PC's can search the Cesspool, full of Turkey poo, and uncover 1d3 random cyphers. These are all eggs that have been warped by the alchemy. Vincenzo is located in the Slaughter Chamber... er... I mean Surgery Room. This is where he'll make the final stand, with at least one Ghoulbbler at his side. GM Intrusion Idea... GROUP INTRUSION! If the PC's have freed Daphne, she will lead them through the secret door into the Slaughter Chamber. Essentially she is delivering the PC's to their potential doom, and will try to assist her former master. Treat Daphne as a Level 4 threat with 12 health. Instead of attacking, she will work to increase the difficulty of all PC actions by 1 step during the battle until she is defeated. If the PC's search, they can find a secret path outside of the Nest that leads to thousands upon thousands of turkey nests in a much greater chamber. There is no way the PC's can deal with this threat now, especially as they start to hatch. Probably best to get out now! With Vincenzo defeated or captured, the PC's can return to Cryserech and speak with Ishver. They will certainly get a reward, and if they speak of the greater threat, Ishver may give the PC's a small force of soldiers to defeat the threat. This could lead to a second turkey-themed Gods of the Fall adventure... of your own design! Trained War Turkey - 3 (9): Vincenzo only selected the finest war turkeys for his Fowl Soul Transplantation stock. These Trained War Turkeys are used like attack dogs. Motive: Protect the Fallen Keep. Environment: Anywhere around the Fallen Keep, or in the occasional Cryserech military unit. Movement: Short, can fly a short distance as well. Combat: The Trained War Turkey prefers to glide in for a stealthy attack and then flee. Interaction: Trained War Turkey's can't be reasoned with or bargained with. They will find you. They will kill you. Use: Trained War Turkeys are a little known secret of Cryserech's military. Ghoulbbler - 4 (12): The failed husk of a botched Fowl Soul Transplantation. Environment: Anywhere around the Fallen Keep. Modifications: Stealth as Level 5. Ghoulbbler's are creepy buggers! Combat: Ghoulbbler's prefer to attack through stealth an assassination. On the first round of combat, if the target is surprised or hasn't attacked yet, the Ghoulbbler's attack is at a difficulty of 6. Interaction: Ghoulbblers may be the broken experiments of Vincenzo, but they still serve their master. Use: Even if the Fallen Keep is cleansed of evil, there still may be a few Ghoulbbler's running around the area. An infestation of Ghoulbblers in Cryserech could be a fun adventure too. Loot: Every fourth Ghoulbbler may have a cypher in their tummy. Vicenzo Vincenzi, the Foulest Fowl - 6 (18): Ringleader of the Feathered Salvation. Motive: To find a way to mass-produce the process of Fowl Soul Transplantation as an alternative to the necromigration. Environment: Anywhere in the Cryserech region of the Nightlands. Modifications: Speed Defense is reduced to Level 5, as Vincenzo is still getting used to his new form. Cranberry Concoction: Sugary boost that increases Vincenzo's Speed Defense to Level 7 for one round. Gravy Boat: Slathering pool of oily sauce that can be tossed at one target. Level 5 speed defense roll to dodge. If struck, the target immediately drops to the ground, unable to stand for the round. Mind Melting Yams: Steaming hot yams are lobbed at the target. Level 6 Intellect Defense or the target starts seeing images of themselves getting stuffed, basted, and cooked. These mental images increase the difficulties of all the target's actions by 1 step for the next round. Interaction: Vincenzo would rather talk his way out of combat before having to resort to violence. But he isn't afraid to toss some gravy! Use: Vincenzo fits into this adventure, but he could be a recurring villain in an entire holiday themed adventure. Loot: 1d3 Cyphers (alchemical formulations). I hope you enjoyed this third annual turkey-themed Cypher System escapade! If you happen to run Fowl Deeds with your own group, please let me know how it goes.